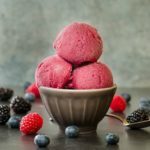 A recipe for Berry Burgundy Sorbet made with Burgundy wine, blueberries, raspberries, and blackberries. It is a light and delicious dessert for any occasion. Heat sugar and water in a saucepan until the sugar dissolves to make a simple syrup. Remove from the heat to cool. Purée berries in a food processor fitted with a knife blade. Press the puréed berries through a fine mesh sieve set over a medium bowl to get the berry juice. Discard seeds and pulp. Add simple syrup and wine to the berry juice and stir to combine. Cover and refrigerate until thoroughly chilled or overnight. Transfer sorbet to a freezer safe container and freeze for at least 2 hours. Serve and enjoy! Time stated includes refrigeration, churning, and freezing. Hands-on is only about 15 minutes.